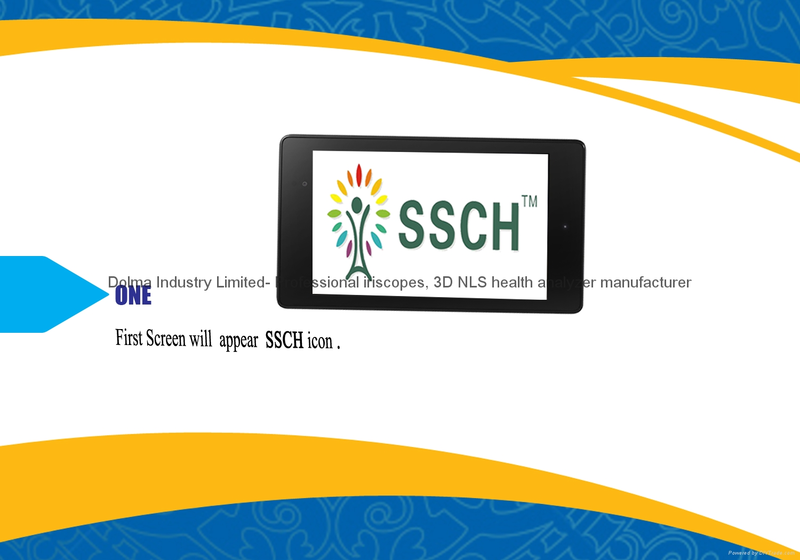 The medical device "SSCHBRT" is indicated for administration of bioresonance therapy (BRT), a therapy administered with the help of impact exercised by electromagnetic waves which, on the basis of bioresonance, help to restore mechanisms of recovery and self-regulatory system destroyed by diseases. Exogenous bioresonance therapy allows administering electrotherapy by rectangular pulsed currents, having variable repetition frequency and load factor (from 0.1 till 10000 Hz and from 10% to 50%). The frequency spectrum of human brain's waves (frequencies of Foll, Schmidt and Rife) is utilized for administration of this therapy. Administration of exogenous bioresonance therapy is possible with usage of hand electrodes-wristlets as well as without contacts: with the help of high frequency electromagnetic field that has been modulated by therapeutic frequencies. BRT not only restores body’s damaged functions but also has destroying influence upon parasitic agents. The device contains a large list of anti-parasitic programs. • Anyone whom you trust may use the device. There are some profiles on one devise. The quantity of profiles is not limited. • Two functions, therapy and programming, are in the same devise. You don't need to have a computer to make programming of the device. 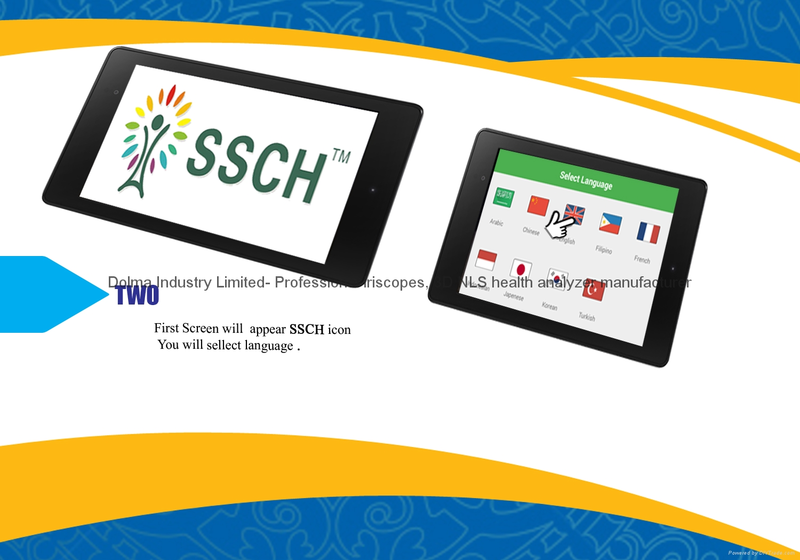 • SSCHBRT has a huge database of treating programs which is divided into certain usual categories. 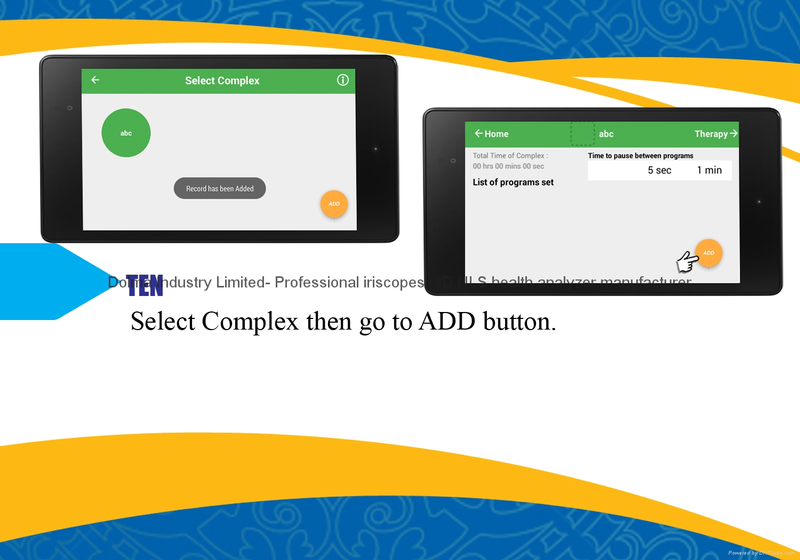 • There is possibility to set time for pause between programs which are included in the complex. • You may review units of frequencies that compose programs. 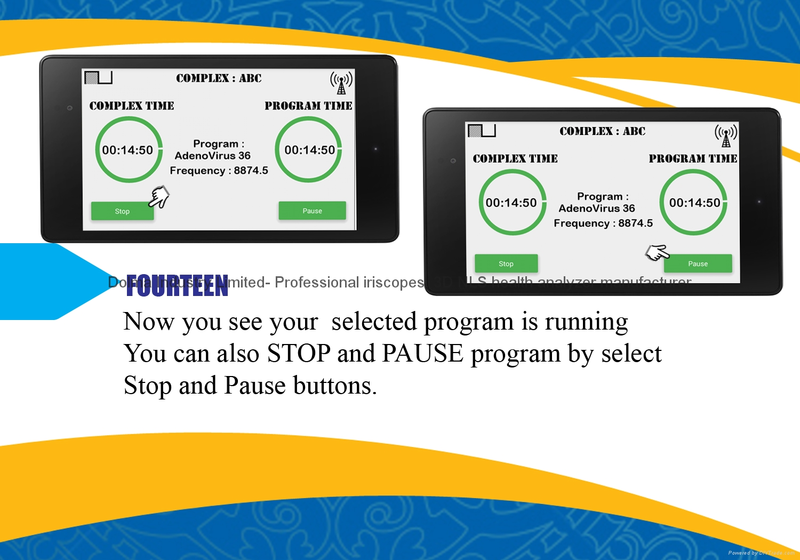 • There is possibility to set time of frequency in each complex's program separately. • There is a possibility to choose among two levels of radiation power in case of contactless impact. • You may regulate frequencies of modulating signals discreetly from 10% till 50%. • Impact's parameters of each healing complex are set individually and saved till the next changing. • You may read favorite books, surfing internet, listen to music, watch films, play games, take pictures, make reports or do any other thing during the therapy. 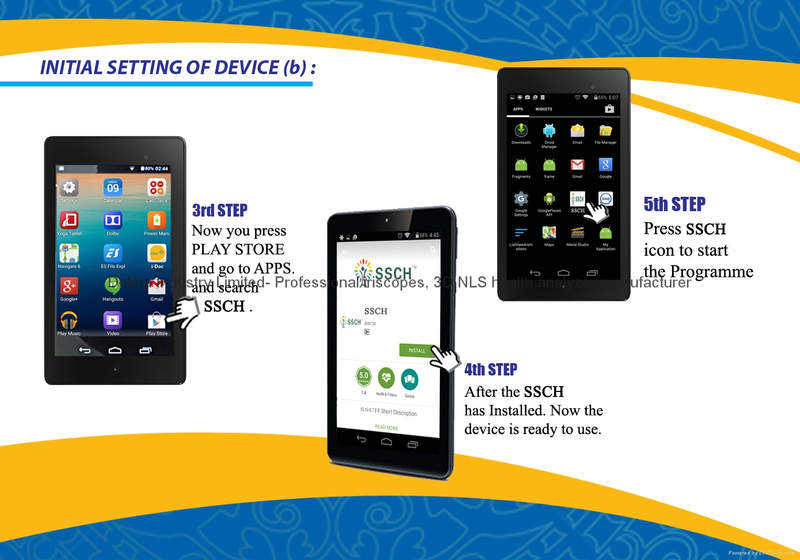 It is possible because you possess not only a therapeutic device, you have a real Android PC. The main idea of administration of resonance in medicine is following: it is possible to enhance normal (physiological) oscillations in the body and reduce pathological ones in case of correct selection of frequency and form of treating (electromagnetic) impact. Thus, bioresonant impact can be exercised for neutralization of pathological oscillations as well as for restoration of physiological oscillations destroyed during pathological states; it means that this therapy suppresses hindrances (noises) in informational field of the body. A healthy body, regardless of the age, preserves and supports relative synchronization of various oscillating (wave) processes which help the body to keep the state of balance, integration and health. The imbalance and destruction of frequency-wave homeostasis' harmony appears during development of any pathological and pathogen processes. So, new pathogen perverted oscillations and resonances develop. They sustain diseases and prevent treating. As a result, the program of self-restoration and self-healing given by the nature is being crashed. The task of the device "SSCHBRT" is following: to restore the correct healthy energy potential of organs and systems gradually and to substitute unhealthy rhythms and frequencies by healthy ones (from the point of view linked with resonance). 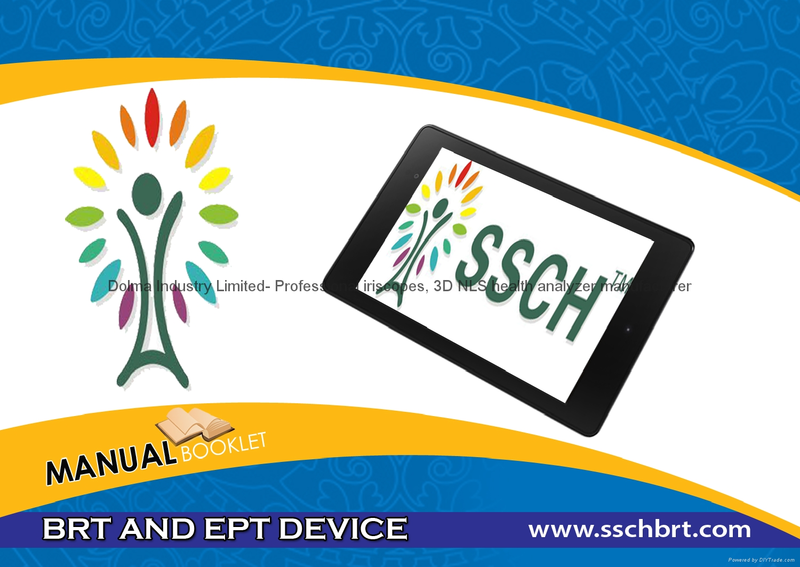 The basis of treating method by the device "SSCHBRT" is solving the problem of creating a way of electromagnetic therapy which makes it possible to provide harmonious work of organs and systems of the human body with the help of resonant phenomena caused in the body by specified frequencies. The method of electromagnetic therapy is based upon the following fact: restoration of health and elimination of disease's mechanisms is achieved because impulse low-frequency electromagnetic field, carrying certain frequency modulated by various frequencies, influences on the body. 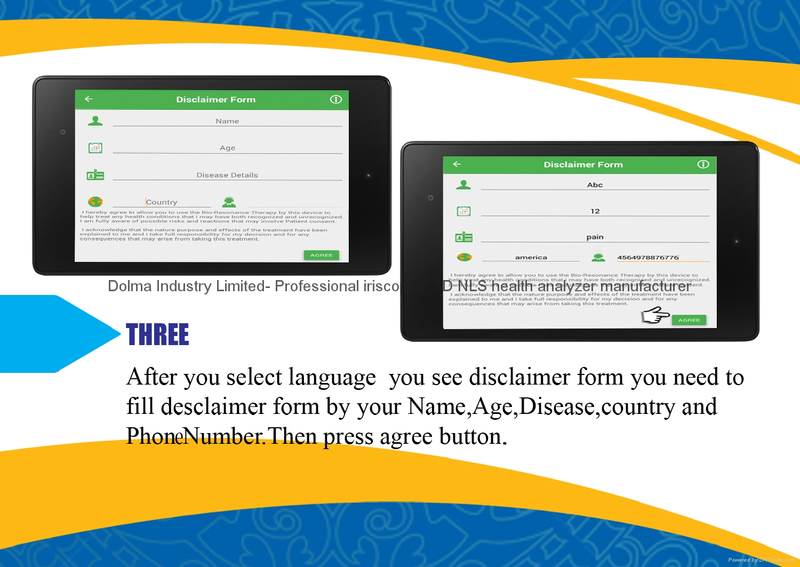 The device is indicated for usage at home. The therapy includes certain sessions that compose a treatment course. A session means a single usage of certain program. You may administrate some sessions per day. Evident effect is caused by a course therapy. A course therapy lasts 14-21 day; one or two day-break is at the end of a course. A therapy may include 5-7 courses. The device may be put with the backside near the damaged organ for getting better results. More essential results are achieved, when this therapy is combined with others during treatment. Try to avoid hard physical activities on the days of administering procedures! In case of acute diseases (such as poisoning, ARI, acute respiratory diseases, flu, etc.) it is recommended to do procedures in each two hours till complete improvement of your state and removal of diseases' symptoms. Usage of the device "SSCHBRT" doesn't exclude medical therapies and means of natural therapy; on the contrary, it enhances effects of the latest. How does impact by the device SSCHBRT take place? The device SSCHBRT reproduces informational signals of our body. Electromagnetic oscillations of low intensity which are generated by the device cause resonance response in the organism. Thus, the following processes take place in the body: activation of physiologic oscillations which correspond to healthy cells and organs, and neutralizations of pathologic oscillations caused by ill cells and tissues, viruses, bacteria and fungi. As a result, the organism restores normal functioning of ill organs and homeostasis of its systems. Applying SSCHBRT, we run body's natural mechanisms of self-regulation. Effectiveness of applying bioresonance therapy is explained by impact on regulatory links of adaptation system through biophysical processes which are above biochemical ones in the hierarchy of body's regulatory system. Thus, not only symptoms but also causes of diseases are exposed to the impact. Post-clinical trials and experience of applying by patients with various diseases display high efficiency and complexity of impact by bioresonance therapy. Applying the device for getting health, it is possible to prevent irreversible changes in the body. Since the device is widely used, it is applied together with any other methods of treatment, prevention and rehabilitation, improving these processes. How should SSCHBRT be used? It is very easy to use SSCHBRT. 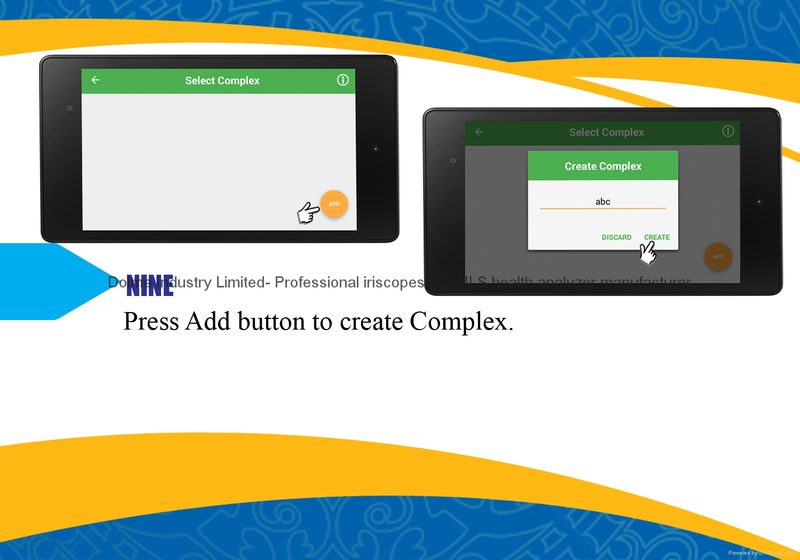 After turning on the device, you should choose needed complexes of programs, switch on them, and do anything you desire without paying attention on work of the device. Since the apparatus has insignificant weight and small dimensions, you can take it with you wherever you go. Even a child can be learnt to use the device. Functionality of the device allows using over 4000 physiotherapeutic programs which compose complexes. 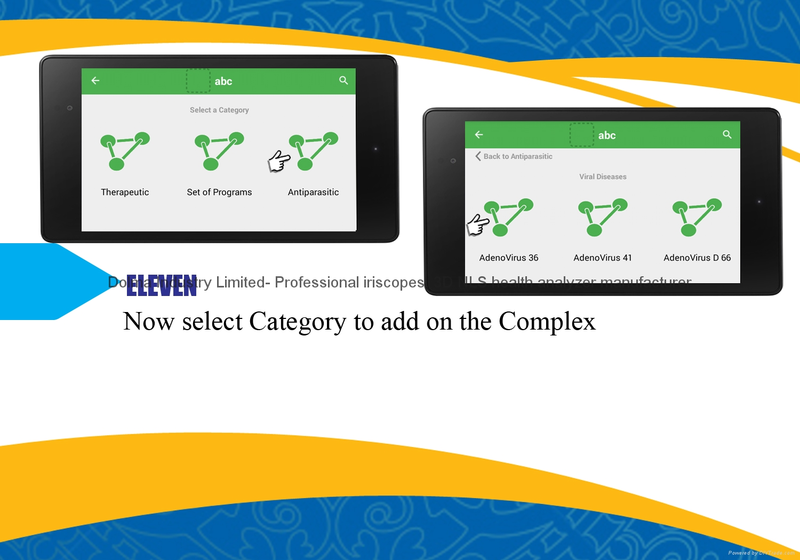 Each program represents a set of frequencies generated by the device consistently with specified time duration. If the device lacks required frequencies, there is a functional possibility to compose own programs via our engineer, entering frequencies by hand. Regime and time of impact can be regulated. The device is equipped with a miniUSB port for connection with PC. This port can be also used as an input for power supply from external source and battery charge. 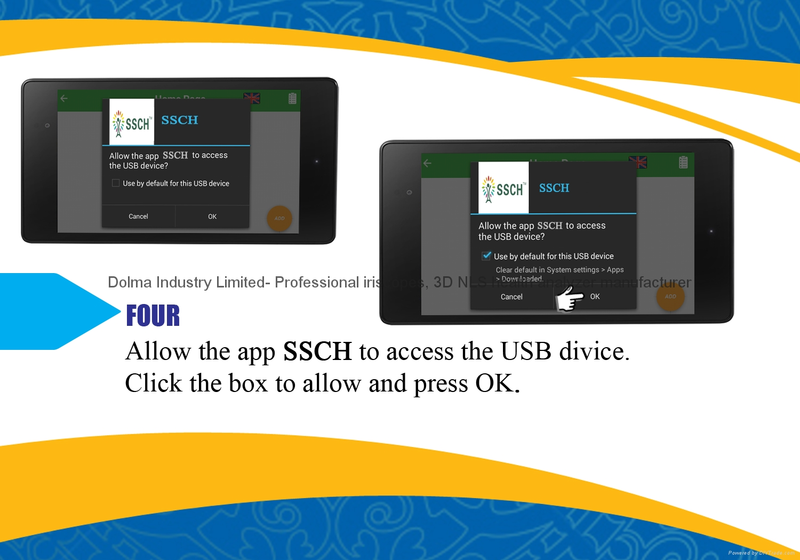 The detailed instructions attached to each device can help to understand essence of applying SSCHBRT quite quickly. To make the treatment more effective, it is recommended to contact a doctor that can help you to compose complexes of programs. A therapy consists of sessions which compose a course of treatment; each session is a single impact by certain complex of programs. It is allowed to apply several sessions daily. Relatively more evident effect is caused by a course therapy. 1, How about warranty and how does it work for those of us in USA? Yes we have 1 year warranty, and you have to send it back to us for warranty claim. 2, what is the power of antenna? The power is around 50 mw. 3, How about the wave from the RF board,sine wave or rectangle wave? The wave is rectangle wave. 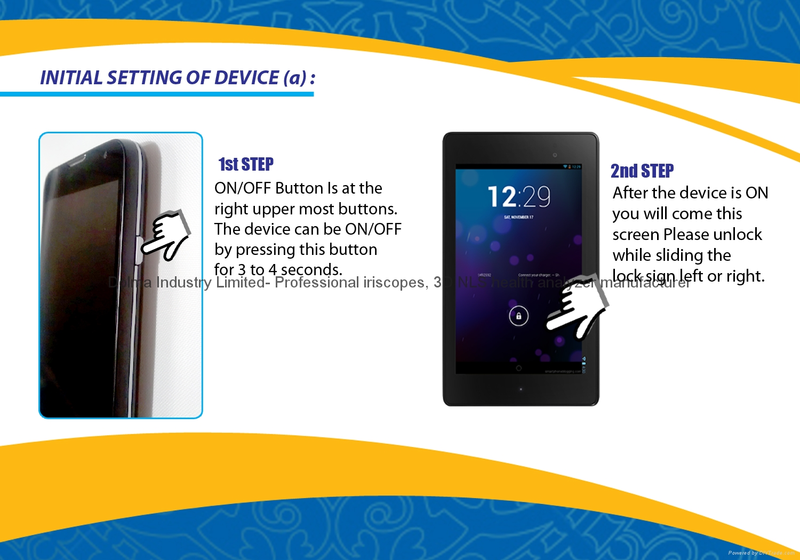 4, When tablet is placed inside pocket, How many part of energy will be absorbed? Normally About 50%, but up to distance . 5, Have anyone already tried this equipment to prove that it works? Yes you can see the frequency behavior on oscilloscope and its pattern. 6, What are possible risk and reactions related to use of this device? There is no risk and reactions to use of this device. 7, Are there any guidelines on how often or how long to run a program? The guideline is provided by doctor how long you use or run a program. 8, Does it require for internet connection? You required internet connection for update and install application from Google play store only. Yes we received many testimonials from people they recover fast and they feel better after using our device.